Health care isn’t on the list of things you enjoy. But when you need care – whether it’s with your family doctor, in the ER or hospital, or during a test – you expect to be treated the way you want to be treated. You want a good experience. At LVHN, we are driven to give you the experience you expect and deserve no matter where you are receiving care. And we’re always working to make your experience even better. To ensure we’re giving you what you want, we closely monitor the results of surveys patients take after receiving care at LVHN. The results tell us where we’re meeting your needs and where we have opportunities to improve. One year ago, for example, colleagues from the LVH–Pocono emergency room (ER) realized they could do more to give patients a great experience. So, they took action. Here is what they did. RN at registration – A nurse is now stationed at the registration desk. If there is a room available, the nurse will take you from registration directly to the room. There, a nurse determines the severity of your condition (triage). The simple fact that you don’t have to sit in the reception area greatly enhances your experience. 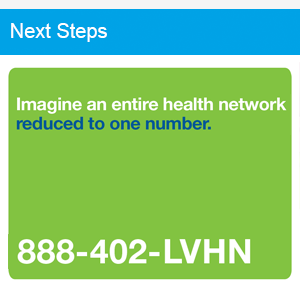 Regular rounding – Hospital leaders regularly visit the ER to speak with patients. They ask if there is anything they can do to make your experience even better. A clinical supervisor was also added to off-shifts to address patients’ needs in real time. Your input is welcomed so we can ensure your satisfaction with care. Efficient use of space – The triage space is where a nurse evaluates the severity of your condition. When that space is available, physicians will use it see patients who need simple procedures, such as the removal of stitches. That gets you out the door quicker. Special care for kids – Children who need care are given iPads to play with while they wait. Kids also can choose their own pillow case, each with a different color and design, and take it home after the visit. These small things help comfort children when they need care in the ER. Are these steps giving patients a better experience? You bet. ER-related complaints to the patient relations department are down 75 percent. In November, patient survey results were so high, the LVH–Pocono ER ranked in the top 5 percent among ERs nationwide. We’re proud our team worked together to make these improvements and know that when you visit the ER, you will consistently receive compassionate, respectful and efficient care.